Posted May 22, 2018 & filed under Things to do in Dewey Beach DE, Visit Rehoboth Beach. 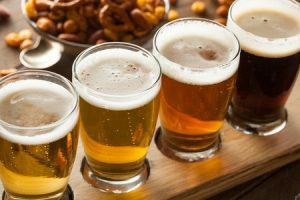 Beer lovers take note—a new brewery has opened up in Dewey Beach! 38°-75° Brewing is located at 2000 Coastal Highway, Suite 105, and is now open for business! The brewery is a project of longtime local favorite Gary’s Dewey Beach Grill, which has been serving up healthy, flavorful food since 1991. In addition to the brewery itself, Gary’s will be serving 38°-75° beers, both on tap and to go. The craft brews will perfectly complement Gary’s menu of wholesome classic bites like turkey burgers and pita pizzas. 38°-75° had its soft opening in July, but summer is the perfect time to discover its rotating selection of creative, house-brewed craft beers including the ginger saison made with fresh ginger, the tart cranberry pale ale made with 100% pure cranberry juice or the sweet potato ESB brewed with real sweet potato and molasses. The brewery’s name comes from its longitudinal coordinates. Co-owner Holly Ski explains: “We wanted to incorporate Dewey Beach somehow … We love the beach, sailing and being on boats.” Dewey Beer Co. was already taken—it’s the name of the area’s first brewpub—so the team of co-owners looked up the local coordinates and, voila, the name was chosen. The new 38°-75° brewery is just a pleasant five-minute walk from the Atlantic View Hotel. We offer stunning ocean views, unparalleled beach access and comfortable rooms. We’re the perfect place to relax after a few cold ones. Give us a call today at 1-800-777-4162 or book your stay online.